World War II caused the United States and its citizens to ration certain materials with the purpose of keeping around important resources for winning the war — such as artillery. The United States Treasury and the U.S. Mint followed suit. While most people are aware of the steel Lincoln pennies which were produced in 1943, few people seem to know that the Jefferson silver nickels also spent a short period of time being produced under a special composition issue. With nickel an important military material, the United States Congress required the U.S. Mint to begin striking nickels from a composition of copper (56%), silver (35%), and manganese (9%). The silver Jefferson five-cent coin composition went into production on October 8, 1942 — just months before the metallic profile of Lincoln pennies changed to steel in 1943 to help ration copper for war ammunitions. Here’s more about those silver Jefferson wartime nickels. With the U.S. Mint having already begun striking 1942 nickels in the usual 75% copper and 25% nickel composition, the use of the copper/ silver/ manganese alloy started late in 1942. This special composition would last the duration of World War II thereafter — right on through 1945. Ironically, of course, there is no nickel in these nickels. Yet, most people still refer to the 1942-1945 silver 5-cent pieces as nickels anyway. Up until 1942, Philadelphia-minted coins never bore a mintmark. Philadelphia has always been the “main” U.S. Mint (or the U.S. Mint’s headquarters, to use modern corporate lingo), and no mintmark was attributed to those coins. After 1945 (the end of the silver war nickels period), U.S. coins would not again bear a “P” mintmark until 1979. The wartime nickel mintmarks are huge — virtually unable to be missed by the naked eye. While some people have relative difficulty finding mintmarks on other U.S. coins, the same cannot be said of wartime nickels and their mintmarks. 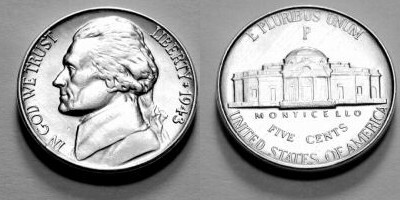 In fact, finding the large mintmarks over the dome of Monticello on the reverse of the coin is the easiest way to tell wartime nickels apart from “regular” nickels! As the value of silver has risen over the past several decades, so has the demand for, interest in, and value of wartime nickels. With the rise in silver prices during the mid 1960s, the heavy spike in silver bullion values during 1979-1980, and recent inclines in the price of silver, collectors and investors alike have been paying more attention to this run of 11 different silver nickels which were produced during the height of World War II. How Much Are Wartime Silver Nickels Worth? Naturally, you’re probably wondering how much your wartime Jefferson silver nickels are worth. While it’s important to keep in mind that most coins need to be physically examined and appraised by a professional coin dealer in order to determine their full value, most silver nickels in worn condition will be more or less worth their “spot” price. That is, the amount of money the metal inside the coin is worth. Since silver prices fluctuate hourly (yes, bullion can be and is a highly volatile market), it is wise to refer to a current silver price chart. According to this silver pricing calculator, if silver values are $15 per ounce, then the silver in a wartime Jefferson nickel is 84 cents. If silver is $16, then the silver value of a wartime nickel is 90 cents. With prices at $17, a single wartime nickel contains 96 cents of silver. If you have a Jefferson wartime nickel that is uncirculated or contains errors, your coin will be worth considerably more than the spot price. Did you notice that there are more than 11 coins listed in the values above? That’s because there are few Jefferson wartime nickel errors worth noting called doubled die nickels! Silver Jefferson war nickels can be quite fun to collect. This short series of just 11 coins (which are part of the larger Jefferson nickel series spanning from the current day back to 1938, when the first Jefferson nickel designed by Felix Schlag was first minted) can still be had for a relatively inexpensive price!